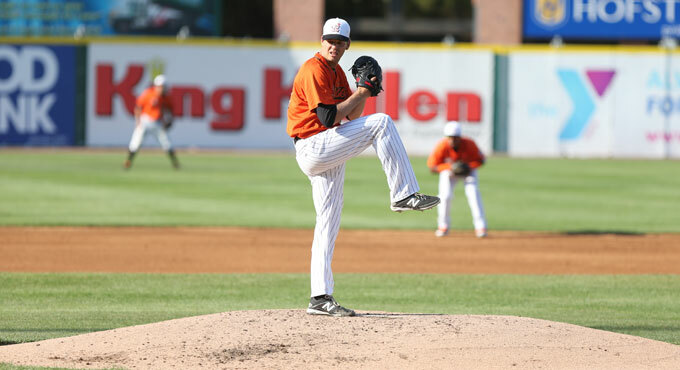 (Central Islip, N.Y., Aug. 9, 2015) – The Long Island Ducks were defeated by the Camden Riversharks 4-3 on Sunday night in the opener of a four-game series at Bethpage Ballpark. Long Island opened the scoring in the first inning on Mike Blanke’s two-out RBI single to left-center field off of Riversharks starter Eric Smith. It stayed that way until the sixth when Anthony Vega’s RBI triple to left-center doubled the lead to 2-0. Camden rallied to tie the game in the seventh on a solo home run to left by Daniel Rockett and a RBI double down the right field line by Michael Rockett. A run-scoring wild pitch by Dan Blewett in the bottom of the inning put the Ducks back in front 3-2. However, the Riversharks jumped back ahead for good in the eighth on RBI singles from Jose Gil and Eric Frain off of Ducks reliever Ryan Kussmaul. Neither starter factored into the decision. Ducks starter Rich Hill pitched six scoreless innings, allowing just two hits and two walks while striking out 14. Smith lasted six innings, giving up three runs on nine hits and a walk with six strikeouts. Blewett (1-4) picked up the win with a scoreless inning of relief, and Kussmaul (3-2) suffered the loss, surrendering two runs on four hits and a walk in one inning. Matt Gorgen earned his 22nd save of the season with a scoreless ninth. Dan Lyons led the Flock with three hits, while Vega and Delta Cleary, Jr. and Cody Puckett each added two. The Ducks and Riversharks continue their four-game set on Monday night. Game time is slated for 6:35 p.m., with the Bethpage Ballpark gates opening at 5:35 (5:20 for full season ticket holders). Following the game, all fans in attendance will be treated to a Pyrotecnico Fireworks Extravaganza, presented by AdvantageCare Physicians. In addition, it's a 20K Match Game Monday! During the game, the Ducks will post a special Vehicle Identification Number (VIN) of a featured vehicle. If the last six digits of YOUR driver's license number match that number, you'll be the lucky winner of $20,000. Right-hander Bruce Kern takes the mound for the Ducks against Riversharks southpaw and former Duck Daniel Herrera. Duck Tales: Rich Hill tied a franchise record for a single game by striking out 14 Riversharks batters. The only other Ducks pitcher to strike out 14 in a game was Mike Loree, who accomplished the feat on September 15, 2011 at Southern Maryland. In two starts with Long Island, Hill has allowed just two hits and three walks in 11 innings of work while striking out 21 batters…Dan Lyons earned his second consecutive three-hit game with a trio of singles on Sunday. The shortstop also had three hits Saturday on a double and two singles. He leads the Ducks with nine three-hit games in 2015, two more than Delta Cleary, Jr. and Reegie Corona. Last year, Lyons collected a total of two three-hit games. He has now reached base safely in 15 of his last 16 games dating back to July 23…Delta Cleary, Jr. collected his second straight two-hit game and third two-hit contest in his last four games. The infielder has hit safely in five consecutive games and is batting .381 during the streak (8-for-21). He now has a total of 13 two-hit games and 21 multi-hit contest this season…Frank DeJiulio, Jr. tossed a scoreless inning for the Ducks in the ninth. The right-hander has now made 12 consecutive appearances without allowing an earned run, dating back to June 10. In that span, he has given up just eight hits and two walks while striking out 13 batters. J.Gil (17), D.Rockett (23), E.Frain (1), M.Blanke (27), A.Vega (11). HP--F.Lentini (1), C.Puckett (7), J.Griffin (3). SB--C.Guzman (17). LOB--Camden 9, L Island 12. DP--P. Matera(2B) - Z. MacPhee(SS) - J.
WP--E.Smith (10), D.Blewett (10), M.Gorgen (2). PB--J.Gil, M.Blanke. 26-19, R.Kussmaul 24-18, F.DeJiulio Jr. 14-10.